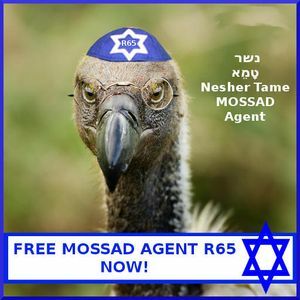 Free Mossad Agent R65 Now! The accusations went viral, according to Ha’aretz, with hundreds of posts on Arabic-language websites and forums claiming that the “Zionists” had trained the birds for espionage. At first, I must admit, I was skeptical of the accusation. But, coming on top of the Zionist shark attack that killed and maimed tourists on Egypt’s Red Sea, the notion that R65 is indeed an Israeli spy seems quite credible. As such, I’d like to make a personal plea, on behalf of CiF Watch, to the Saudi government, on humanitarian grounds, to please free Mossad Agent R65, now. Agent R65 seems to wear a monocle which to me suggests some kind of connection to the Brits. I demand that the Red Cross – or even the Red Crescent – visit him and make sure he is being treated in accordance with international law, the Geneva Conventions. I hope PETA will organize a parade of beautiful women dressed only in a few feathers to draw attention to Mossad Agent R65’s plight. The Chief of Police from Dubai has requested permission to interrogate him (or her – the gender is still uncertain) as video in the hotel in Dubai identified Agent R65 during the assassination of that Hamas arms trader. Turns out that Agent r65 set out on his mission the day before his capture from the secret Mossad training base at Gamla cunningly disguised as a nature reserve. It’s so absurd that we have to all laugh it off. However, once we step back for a minute and consider the paranoia and hatred of the Arab world towards Israel it is indeed sobering. With a beak like that R65 must be Jewish. Come to think of it, it may be a Arab double agent. Hoi Polloi, please, the vulture is enough trouble. 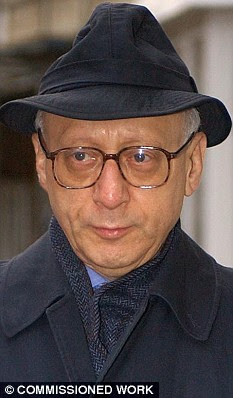 Don’t insult the poor creature by comparing him with Gerald Kaufman. He looks very scholarly – definitely a yeshiva bocher. The vulture is better looking than Kaufman. I was struck by the irony: one vulture is a Mossad agent, the other is a Hamas agent. I know this isn’t a popular opinion but he knew what he was getting himself into and was ready to face the consequences if he got caught. He was repeatedly warned not to wear the skullcap. Everyone knows Jews aren’t allowed into Saudi Arabia but he argued that it didn’t apply to vultures. He’s an embarrassment to the rest of us.